This package was approved by moderator gep13 on 10/24/2018. 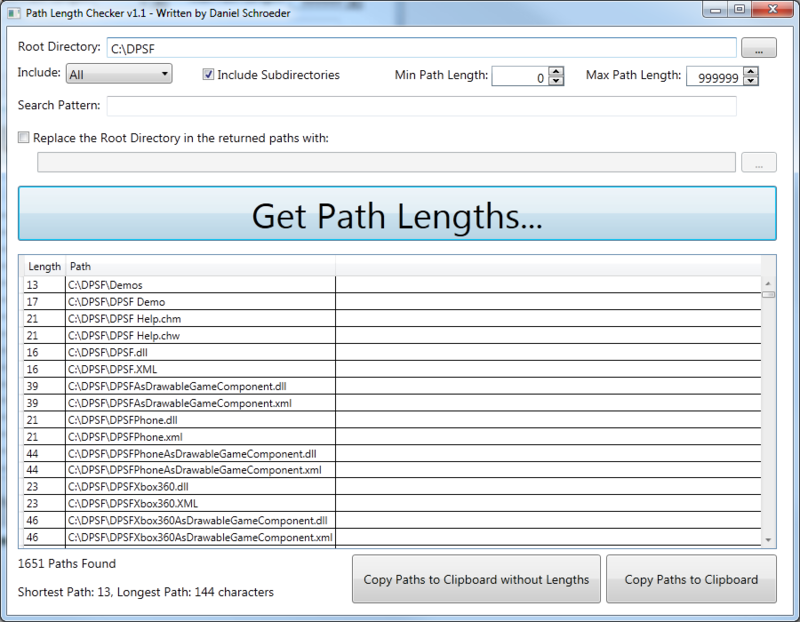 Path Length Checker is a stand-alone app that allows you to specify a root directory, and it gives you back a list of all paths (i.e. files and directories) in that root directory and their lengths. It includes features such as pattern matching and min/max length constraints, as well as the ability to specify a string that should replace the root directory in the results brought back, allowing you to quickly see path lengths if you were to move the files/folders to another location. $StartPath = Join-Path $env:ProgramData "Microsoft\Windows\Start Menu\Programs\"
$Link = Get-ChildItem $StartPath -filter "$env:ChocolateyPackageName*"
$Destination = Join-Path $env:ChocolateyPackageFolder "v$env:ChocolateyPackageVersion"
$targetPath = Get-ChildItem $Destination -filter "*GUI.exe"
This discussion is only about Path Length Checker and the Path Length Checker package. If you have feedback for Chocolatey, please contact the google group. Tell us what you love about the package or Path Length Checker, or tell us what needs improvement. Deployed from e27d7a207f. You are on web.3. UTC time is currently 26 Apr 2019 15:17:44 +00:00.